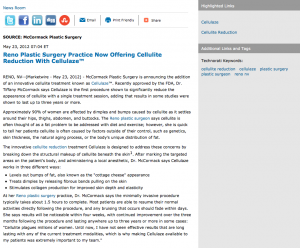 Reno, NV — McCormack Plastic Surgery is announcing the addition of an innovative cellulite treatment known as Cellulaze™. Recently approved by the FDA, Dr. Tiffany McCormack says Cellulaze is the first procedure shown to significantly reduce the appearance of cellulite with a single treatment session, adding that results in some studies were shown to last up to three years or more. Approximately 90% of women are affected by dimples and bumps caused by cellulite as it settles around their hips, thighs, abdomen, and buttocks. The Reno plastic surgeon says cellulite is often thought of as a fat problem to be addressed with diet and exercise; however, she is quick to tell her patients cellulite is often caused by factors outside of their control, such as genetics, skin thickness, the natural aging process, or the body’s unique distribution of fat. Dr. Tiffany McCormack is certified by the American Board of Plastic Surgery. She is a Fellow of the American College of Surgeons and a member of the American Society of Plastic Surgeons, the American Society for Aesthetic Plastic Surgery, and the American Society of Bariatric Plastic Surgeons. Dr. McCormack completed her plastic surgery residency at Stanford University Medical Center and continues to pursue the latest developments and technical excellence in cosmetic and reconstructive surgery. She also recently received the 2011 Patients’ Choice Award. McCormack Plastic Surgery is located at 10685 Professional Circle, Ste B, Reno, NV 89521, and can be contacted at (775) 284-2020. Dr. McCormack and her team can be contacted online at www.plasticsurgeryrenotahoe.com, or their Reno Plastic Surgery Facebook page.